5 Upcoming Cricket Games 2019 : Hi Guyz, Aj apko 5 Upcoming Cricket Games 2019 btaunga, ye games Android/iOS dono ke liye hai or ye Best Android Games & Best iPhone Games me aati hain. Also, me apko in 5 Upcoming Cricket Games 2019 ke related kuch Information or in games ki release date btaunga. 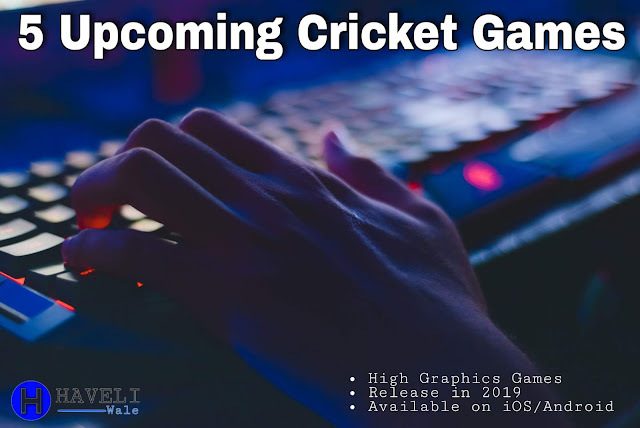 Ye 5 Cricket Games 2019 me Release hone wale hain or ye Games Android & iOS DonO ke liye honge. Ye Game officially ab tak release hone wali thi but is Game me kafi ziyada bugs a rahe the is liye iski Release Date thori delay kardi hai, Now ye Game December 2018 ya January 2019 me Release hogi. Stick Cricket ka to sabhi ko maloom hai, Stick Cricket already kafi saare games Playstore & App Store par launch kar chuka hai but wo sab games 3D me nahi hain, Stick Cricket ki all games me just back view hota hai. But ye Game 'Stick Cricket 3D' full 3D view me ayegi, Really kafi log Stick Cricket ki is Game ke liye Excited hain. Stick Cricket 3D ki Release Date Confirm nahi hai but ye game 2019 me he Release hogi. MS Dhoni cricket game bohat amazing hai is game ke Graphics or features, Now ye news mil rahi hai ke MS Dhoni game ke developers MS Dhoni 2 par work kar rahe hain. And MS Dhoni 2 as soon as possible launch kardi jayegi, MS Dhoni 2 2019 me Release hogi Or ye game MS Dhoni se behtar or kuch new features kr saath launch hogi. Ye Game obviously Indian developer ki taraf se hogi B'coz Bhuvneshwar Kumar Indian team ke bowler hain or is se pehle bhi Indian team ke kafi players ke Name se cricket games launch ki gai hain. Bhuvneshwar Kumar game bilkul ready hai or iski Release date 10 October btai ja rahi hai, But dekhna ye hai ke ye game 10 October ko launch hoti hai ya nahi Or launch hoti hai to ye kitni Cricket Games ko tough time degi. Big Bash League Australia ki 1 Cricket League hoti hai us cricket league ki 1 game kuch time pehle launch ki gai thi Big Bash League Game k naam se or ye kafi Amazing thi. Now, ye news saamne aa rahi hai ke Big Bash League 2 game par work continue hai or 2019 me he is Game ko release kiya jayega Playstore & App store par. At Last : Mujhe Umeed hai apko ye 5 Upcoming Cricket Games 2019 pasand ayegi or ap bhi in 5 Upcoming Cricket Games 2019 ke launch hone ka wait karenge, B'coz ye Games Best Android Games or Best iPhone Games me aati hain.